Well, it was one of the most anticipated episodes of all time. There was hype about it everywhere. 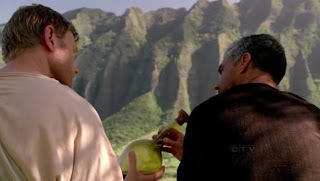 The Richard-centric episode of Season 6, "Ab Aeterno," would answer many questions and finally reveal the backstory behind Lost's most mysterious and enigmatic characters. "Ab Aeterno" is latin for "since the beginning of time" or "for a very long time." Part of me, though, was afraid that I would be disappointed, due to the enormous level of hype and expectations for this episode. But I wasn't disappointed at all. "Ab Aeterno" is without a doubt the best episode of Season 6, and in my opinion, the best episode ever. Not only was the acting impeccable, but the storyline and backstory for Richard Alpert was one of the most intriguing and captivating storylines in the entire series. "Ab Aeterno" expands on many of the existing themes in the season - including good versus evil and Christianity. Richard Alpert, the ageless, calm, and at one point seemlingly omniscient Island advisor has been one of the central enigmas of LOST for a very long time. Every since "The Man Behind the Curtain," when we saw Richard appear to not have aged in Ben's flashback, we have wondered what possible connections and history Richard has had. For a long time I had been thinking that Richard has been on the island for many centuries, from ancient times. He has been on the island for a long time, but not ancient times. In the current time on the island, Ilana, Jack, Hurley, Sun, Miles, and Richard are at the beach camp. Ilana reveals that she is there to protect the remaining candidates (Jack, Hurley, Sun/Jin, etc). She says that Richard will know what to do next. Richard laughs at this, claiming that he has no idea. Richatd has lost his faith (much like Locke at the end of Season 2 and Jack throughout the show) in Jacob, and no longer wants to be the island advisor. He goes off into the jungle. Then, the episode goes to Richard's flashback. He is riding on a horse through a grassy plain - at first I thought that this was the Island. However, we discover that it is in Tenerife, Canary Islands in 1867. He goes into his house, and for the first time, we see his wife, Isabella, who is sick with a high fever. This is one of the first Christian references in this episode. Later on in the flashback, when Richard is in prison, he is reading the Gospel of Luke, chapter 4. Jesus heals Simon's mother-in-law, who was suffering from a high fever (Luke 4:38-39). Isabella gives Richard her cross necklace. Richard knows she needs medicine, and runs to the doctor in town, who refuses to give medicine since he cannot pay for it. Richard accidentally knocks his head on a table and kills him (much like Desmond did to Kelvin in "Live Together, Die Alone"). Richard is sent to prison for this, sentenced to be hanged. In prison he is reading the Bible in English, and we see him reading chapter 4 in the Gospel of Luke. A priest enters, and asks Richard if he is ready to confess. Richard confesses his sins, but the priest falsely states that murder is an unforgivable sin that can only be forgiven with a life of penance, but isn't possible since he will be hanged tomorrow. But Richard is bought as a slave, and now the property of Magnus Hanso. Magnus Hanso, the great-grandfather of Alvar Hanso (funder of the DHARMA Initiative), was only refereneced once before on LOST. According to the blast door map, Magnus Hanso was buried near the site of the Black Rock. This begs the question, how did either Radzinsky or Kelvin know about the Black Rock (considering Horace's apparent unknowing of it), or more specifically, Magnus Hanso? I have a good feeling this will be one of several unanswered questions on LOST (but they can't answer every question). We now go the Black Rock, which is in the middle of inclement storm. This, of course, relates to Black Rock Storm, a painting that was bought for auction by Charles Widmore in "The Constant." In the distance, we see the dark sillhouette of the island and the statue - the prisoners believe that the island is guarded by the devil due to the statue's ominous appearance in the night. A large tidal wave drives the ship right into the statue. This was what caused the statue to break - although it seems a little odd that a wooden ship could completely topple such a large statue. The Black Rock is now stranded in the middle of the jungle. Jonas Whitfield, one of the ship's officers, goes into the brig, where Richard and the other prisoners are located. He begins to kill them, and when Richard asks why, he says it's only a matter of time before they try to kill him. Luckily, we hear the ominous sound we all know too well - the black smoke monster. The officers on deck are all killed, and the monster enters the brig to kill Whitfield. The monster faces Richard, as flashes emit from it (similar to both Juliet in "Left Behind" and Eko in "The 23rd Psalm"). The monster leaves Richard, who is now chained inside the ship. This makes me wonder - why is it, exactly, that the monster decided to keep Richard alive? This is a pivotal question regarding the monster that I hope is answered within the remaining episodes. With no food or water, Richard is chained in the brig. After awhile, Richard sees a blurry image of Isabella. At first he is wary, and then astonished by her appearance. She tells Richard that they are both dead, and that this is hell. This isn't the first time that this thought has come up in LOST - Anthony Cooper had the same hypothesis inside the Black Rock in "The Brig." We hear the monster again, and Richard tells her to run away. We then hear her scream, as the Monster appears on deck. Some time later, a man enters. We discover that it is the Man in Black - not Flocke or any of his other forms - but the real Man in Black, first seen in "The Incident." He tells Richard he is a friend, but before he releases him, he makes Richard promise to do anything he asks. Richard agrees. MIB tells Richard that the devil has Isabella, and that they are indeed in hell. MIB says that the only way to escape from hell is to kill the devil. He then tells Richard to go to the statue, and tells him to stab "the devil" (Jacob) before he speaks (the exact same directions given to Sayid from Dogen regarding MIB). Richard goes to the statue, and is punched repeatedly by Jacob. This is definitely not the Jacob we've come to know (i.e. the cool, calm, collected, soft-spoken) - this is an angry, fierce, and violent Jacob! Richard tells him that a man in black sent him, with orders to kill the devil, and that he thinks they are all dead. Jacob repeatedly dunks him into the ocean, until he admits that they are alive. This is very similar to baptism in Christianity. Jesus was baptized in the Gospel of Luke (Luke 3:21-22). Jacob explains to Richard that he brought the Black Rock to the island, and has brought people to the island in the past, but they are all dead. This brings up another question: Jacob brought the Black Rock to the island, and yet the Man in Black killed the entire crew (except for Richard). So can MIB kill anyone whom Jacob brings to the island? Are there any limitations or boundaries? I think it would be very interesting to get another on-island flashback, showing the island/Jacob/MIB in ancient times. Jacob asks Richard if he wants a job as an ambassodor for him, being an intermediary to the people he brings to the island. Richard says he wants Isabella in return, but Jacob can't do this. He then wants to be absolved of his sins, but Jacob says he cannot do that either. But he can make Richard live forever. Jacob describes the island as a cork, keeping the wine (darkness, evil, malevolence) from leaving. I'm sure this is a very important analogy for what the island is. So what exactly is Jacob? Is it his (or the official island protector's) duty to keep the MIB on the island forever? Richard goes into the jungle, where he meets the Man in Black, giving him a white rock (inside joke?). The Man in Black says that if Richard ever changes his mind, the offer will still stand. There was a very distinct tree located next to them. This made me think of the Garden of Eden, where Satan tempts Adam and Eve in the appearance of a serpent (much like MIB tempting Richard to come with him). This could also be a reference to the tree of life in Revelation 22:14 -- "Blessed are those who wash their robes, that they may have the right to the tree of life and may go through the gates into the city." Back in current time, Richard returns to the tree, where he unburies Isabella's cross. He yells out to MIB, wondering if the offer still stands. He discovers that Hurley has been following him. Hurley says that he can see Isabella. Richard at first is unsure, but then addresses her, although he can't see her. This brings up one of the biggest themes of LOST: faith. Richard has faith that she is there even though he can't see her. Richard puts on the cross necklace. Hurley reveals something that Isabella told him: if Richard doesn't stop the Man in Black from leaving the island, they will "all go to hell." This was an incredible episode, complete with compelling mythology, incredible themes, Biblical references, rich symbolism, and of course, the amazing backstory of Richard Alpert. I must also say that this was Nestor Carbonell's best acting ever on LOST. Feel free to leave your thoughts, feelings, comments, theories, and questions regarding "Ab Aeterno." There is much to discuss and think about!